In 20th Century, players try to make the largest and best nation by the end of the century to score the most victory points (VPs). The game lasts 6 rounds and uses 2 main currencies: money and science. Each round starts with the players bidding for landscape tiles which each show a number of cities and railway lines. Each city has icons showing what they produce (money, science, VPs and recycling) but cities will only produce these resources if they are populated. Regardless of how many cities are on a tile, a player only receives 1 population marker for each tile they buy. When a player wins an auction, they can choose to drop out of the auctions for the rest of that round. Dropping out allows the player to use science to buy a technology tile (from those on display) and the cost lowers as players buy them. The lowering cost is a nice mechanic as it means taking first choice means paying a premium. Technologies give benefits like extra population and locomotives (which can move population markers between tiles a little bit). As the rounds progress, the technology becomes more modern and causes less pollution. Next, players bid on the disasters which can add garbage to landscape tiles and cause pollution – both worth minus VPs at the end of the game. The worse the disaster, the lower the price the player will probably pay to accept it. After that, players add their new landscape tiles to their existing tiles. Placement is important as it affects what garbage and people can be moved along the railway lines. The tiles create a pleasing, growing visual of a landscape (reminiscent of Carcassone). Any garbage that was gained is added to the tiles too. Finally, each player totals the number of money, science and VP icons that their populated cities produce and this will be their income for the round. Players also use recycle icons to remove nearby garbage (depending upon railway links on the tiles). There are some extra bonus points in rounds 2 & 4 and the way these are earned changes from game to game. At the end of the game, each player gets bonus VPs for tiles with no garbage (-VPs for tiles with more than 1 garbage), VPs for their pollution level (which can be -VPs) and VPs for the player with the most money and science left. Overall, 20th Century is relatively simple but there are a lot of choices and it feels different to other games because of the mixture of mechanics. The bidding mechanics work well and there’s a feeling that the sharp edges of the systems have been removed from many game mechanics (like the reducing cost of technology and the handling of turn order) as they seem polished. 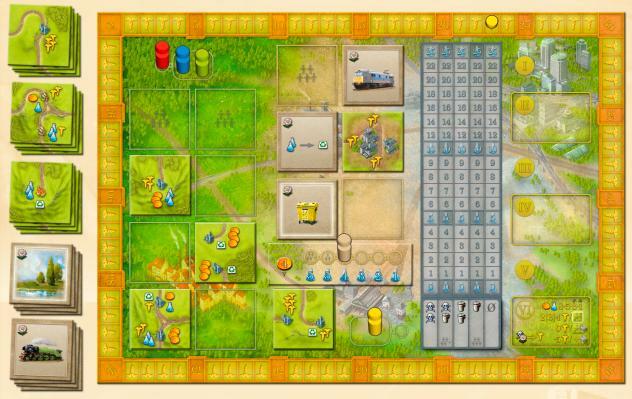 Player interaction takes place on the main game board during auction and disaster bidding, but no-one can interfere with your tile layout. The phase where you add your new land tiles to your existing ones can be a bit fiddly and it can create some downtime – especially for players with only one (or no) tiles to lay out compared with players with multiple tiles to place (and/or analysis paralysis). Placing the tiles is a tricky mental task as you try to create the optimum layout (especially with a lot of tiles). Even though this was thought inducing, I found this slightly laborious and I wanted to focus more on the interactive areas of the game. Also, small errors in your placement/layout can mean you get less income than you might be due with a different layout. There are only 5 auctions in which to buy land tiles and technology so the game feels tight and every coin, science and undisposed garbage is important. The landscape tiles and technologies modernise as the game progresses (as there are specific tiles for specific rounds) so the theme works well this way. 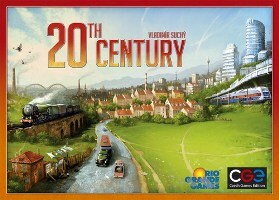 Despite losing my game by miles, I enjoyed playing 20th Century. I tried to be conservative and not create too much pollution or garbage along the way so I would score well on the final bonus points. This didn’t work for me at all. I ended up with a few efficient tiles but caused my income to be lower than other players which meant I fell behind. As a result, my main negative about the game is that it seems very hard to catch-up if you fall behind because other players can outbid you, plus they can afford to buy multiple tiles in a round. Therefore, their income grows faster than yours creating a vicious circle. Also, they can buy good tiles to remove the garbage they accumulated early on. I think there’s good gameplay in 20th Century and you can see the theme developing. As you go through the century, the later tiles have more icons but still look the same so it feels like your city spreads rather than develops into the modern age. However, I think this is mainly a graphical item rather than gameplay and just having more modern looking tiles in later rounds would have delivered a greater sense of the progression of time. I will play 20th Century again and I think I will enjoy it more the second time around now I know some errors to avoid. Whilst the catch-up issue may be a problem for unevenly matched opponents/strategies and make it a harsh game, 20th Century is a solid eurogame with a different feel. This entry was posted on Saturday, December 11th, 2010 at 10:13 am	and is filed under 20th Century, Board Game Review, Board Games, Essen Spiel 10. You can follow any responses to this entry through the RSS 2.0 feed. You can leave a response, or trackback from your own site. Also reading that you lose beacuse of entering vicious circle of having enough income to bid, I think it is a game where the experience is all, so newcomers will do it pretty bad. I agree that there may be relatively few strategies to employ – I’d need to replay it to know for sure though. There’re definitely different a few routes (especially in the selection of the technology tiles) but these may not be that different to each other. The vicious circle of low income is very likely to be an issue that will make it unbalanced when experienced players play less experienced players.